Costa Rica has become a popular tourist destination for nature lovers, backpackers, and budget travelers who want to experience the rainforest, beaches, and unique setting that makes that country beautiful. There are a wide variety of hostels throughout the country that offer a range of styles and amenities. Whether you're visiting Costa Rica to hike, surf, or party, there's likely a hostel that meets your needs. 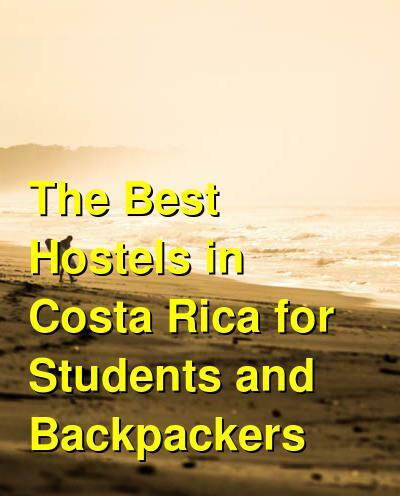 How much do hostels in Costa Rica cost? An affordable hostel for students and backpackers in San Jose, Costa Rica. Hostel Urbano is a mellow and relaxing place to stay where you can meet other travelers and enjoy a good night's sleep. Most travelers to Costa Rica don't spend much time in San Jose, but if you're in town for a night or two, then this hostel is a good option. The rooms are relatively large and every guest in the dorms has access to a security locker. The hostel has four and twelve bed dorms as well as double private rooms people who want a little more privacy. The hostel also has a common room with a television that guests can use. There's a large movie selection and public computers available with internet access. The hostel also has a nice garden area and a pool table. If you want to prepare your own meals, there's a fully equipped shared kitchen. The hostel is also in the university district, which offers access to a variety of cheap and good restaurants and bars. An affordable and quiet hostel in Monteverde (Santa Elena), Costa Rica. Camino Verde Hostel and B&B is a reliable and comfortable option just on the edge of the town of Santa Elena. It has the feel of a family house and it will quickly become your home away from home. It's located about a five minute walk from the center of Santa Elena, so it is removed enough to be quiet and peaceful, but still convenient to everything you might need. It has a bit of a rural feel and it is surrounded by the beautiful countryside. The hostel is small, with just ten rooms available. The rooms are private and sleep anywhere from two to four guests. There's also a free breakfast available and a friendly staff who can help you arrange any number of activities. If you're looking for a peaceful and relaxing setting near Santa Elena, then this is a good option. A good option in Arenal and La Fortuna, Costa Rica. Arenal Backpackers Resort is one of the most popular places to stay for budget travelers in Arenal and La Fortuna. It can feel a bit like a party hostel and there is a nice swimming pool and bar area where guests can hang out. There is also an outdoor space with hammocks and lounge chairs where guests can relax as well. If you have any questions, there's a travel information desk that can help you out. Although the staff can help you with any tours or travel information you might need, it's best to ask around outside of the hostel to make sure you're getting the best deal. The hostel has dorms that sleep either eight or twelve people and there are private rooms that sleep two, three or four. If you're on a tight budget but don't want to stay in a dorm, there are also two bed tents available. Each tent has a double mattress, power outlets, and an outside locker for your valuables. If you're looking for a fun and relaxing place to stay near Arenal, then the Arenal Backpackers Resort is a good option. An affordable and safe hostel in Tamarindo, Costa Rica. Pura Vida Mini Hostel is a popular option with backpackers and budget travelers. It can have a quiet atmosphere but it is in a great location only 200 meters from the beach. Nearby you'll find anything you might need. The hostel does have a nice common area with a pool table and other games. There are rocking chairs where you can relax and hammocks if you just want to hang out. There's also a barbecue and fire pit in the garden. The hostel has a full kitchen that guests can use with two stoves, a microwave, toaster, blender, and more. There are private rooms available that sleep between two and five people. There are also dorms that sleep ten or eleven people. If you want to be near the beach, and don't want to spend a fortune, then this is a good option. An affordable hostel near Quepos and Manual Antonio, Costa Rica. If you're looking for an affordable but basic place to stay between Quepos and Manual Antonio, then this is a good option. There are buses that run frequently in both directions. If you want slightly nicer facilities, there's also a sister bed and breakfast about 200 meters down the road. The hostel has all of the standard amenities that you would expect including a shared kitchen. There's a pool, restaurant, and bar on-site as well. The hostel has two dorm rooms but there are also private doubles available as well. The rooms can be a bit small, but they have everything you might need. The bed and breakfast is a few minutes away and it feels a bit more like a hotel. It has a nice setting and guests can enjoy the pool and restaurant that is located at the hostel. A quiet and affordable hostel in Puerto Viejo, Costa Rica. Hostel Kinkaju is a decent option in Puerto Viejo. It's quieter than some of the more party oriented hostels in the area and it offers a convenient place to stay very near the center of town. The staff are friendly and helpful and the rooms are basic and affordable. There is no air conditioning so it can get a bit hot at night. The hostel is near the beach and several good restaurants. It's also near the local hand craft market and several banks with ATMs. There are dorms that sleep up to six people and private rooms that sleep two, three, or four people. There's also a tv room and free wi-fi that is available to guests. A surfing and party hostel in Jaco, Costa Rica. Room2Board Hostel and Surf School is a bit of a party hostel with a fun and social atmosphere. It's a comfortable place to stay that also offers surfing lessons for guests. Despite the social vibe, the hostel has the feel of a hotel with a wide variety of room types to choose from. There's also a pool, movie room, and a rooftop bar and restaurant where guests can hang out. There's also a shared kitchen available if you want to prepare your own meals. This hostel appeals to all types of travelers, for solo travelers, to large groups. Double, three, and four bed private rooms are all available. There are also four, five, six, eight, and ten bed dorms to choose from. A great hostel near Corcovado National Park and Puerto Jimenez on the Oso Peninsula. Conveniently located right beside Corcovado National Park, Bolita Hostel is a convenient and comfortable option for budget travelers. If you want to experience nature at its best and explore a variety of hiking trails in the area, then this is a great place to stay. It's a truly unique option on the Osa Peninsula, and you're sure to make memories that will last a lifetime. The building is an original farmhouse and every morning you can hear the birds and Howler monkeys nearby. The hostel also has a variety of places for guests to relax, including hammocks, a picnic area, and a shared kitchen. The rooms are open air, and there are dorms and private double rooms to choose from. If you don't want to stay in the farmhouse, there are also new cabins that offer a unique option for guests.